My family and I saved couple of hundred dollars by doing the zip line & cave tubing trip with "butts up"!!! The staff was very friendly and knowledgeable. They are all certified by Belize's tourism school and they treat you very well!! Speedy, John, Tiger and the rest of the crew went out of their way to make sure everyone had a pleasant time and were back in time ;-) The zip line was amazing and the cave tubing was so relaxing & beautiful!! Will definitely do this trip again!! Couldn't afford to pay our cruise's price and they were at the same place we were ;-) 40 minute ride in a bus to a state park to do both things, then get lunch and head back. Can't beat the price!! Can we book with you if we are on a Norwegian Ship that docks in Harvest Caye? Why should I book my Belize Cave Tubing Tour with you? We are arriving on a cruise ship. Will we have enough time to do the ATVing and cave tubing? What form of payments do you accept for tours? How much time is required for each tour? Can my 6-year old go on the cave tubing adventure? Can my 14 year-old ride the ATV on his own? Question: Can we book with you if we are on a Norwegian Ship that docks in Harvest Caye? Answer: If you are on a ship that docks in Harvest Caye you are restricted to NCL excursions only. Cave-Tubing is not an option if your ship is not stopping in Belize City. Note: Harvest Caye is a private island/port owned and controlled by Norwegian Cruise Line (NCL). NCL, is not allowing independent tour operators to pick up their guests from Harvest Caye. Question: Why should I book my Belize Cave Tubing tour with you? Answer: We realize that you have choices and so we are thankful that you have taken the time to browse our site and to get an idea of what we have to offer. The truth is... all the tour companies will take you to the same national park and you will walk the same nature trails and go through the same cave system. What sets us apart is all the extra things that we do to make you feel extra special. Firstly, we provide the best combination of equipment and transportation to ensure your safety and comfort. That is our number one priority. We also take pride in offering the best customer service experience possible by treating all our guests like VIPs. Our guides are famous for going above and beyond to ensure that you are well taken care of every step of the way and for keeping you well entertained on what could otherwise be a boring bus ride. Our tours are much cheaper than the cruise ship tours. Question: We are arriving on a cruise ship. Will we have enough time to do the ATVing and cave tubing? Answer: Yes, you will have enough time to do both tours! In fact, you can also do the zipline if you wish. All our tour packages are designed with cruise ship passengers in mind. In all the year that we have been in operation we have never caused anyone to miss their ship. Question: What form of payments do you accept for tours? Answer: We accept cash only. All our prices are in US dollars. Question: How much time is required for each tour? Answer: 4.5 hours for Cave Tubing alone and 5.5 hours for combo tours. Question: How cold is the water? Answer: Water temperature in the Caves Branch/Sibun river usually exceeds 70 degrees Fahrenheit, which we like to consider as "refreshing" since the normal air temperature is usually well above 80 degrees. Question: Can my 6-year old go on the cave tubing adventure? 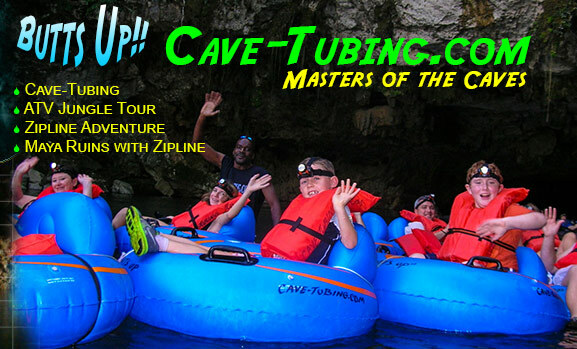 Answer: When it comes to cave tubing it's not so much the age of your child that matters but the height. The Institute of Archaeology which manages the park and caves enforces a minimum height requirement of 40 inches. Park officials will not allow entrance to the caves to anyone who does not meet this requirement. Question: Can my 14 year-old ride the ATV on his own? Answer: Most definitely! We place no age restriction on this activity. You know your child better than us; if you believe he can handle an ATV and you want to allow him to give it a try, then it's ok with us. Answer: Please do not cancel unless your cruise ship has to be rerouted or if there is a delay due to weather (or something else you cannot control). If you do have to cancel for any other reason we ask that you kindly notify us ahead of time. Since we do not require a deposit for booking there is no penalty for canceling.